Clinical Investigator at the C.T. Lamont Primary Health Care Research Centre of the Bruyère Research Institute and Associate Professor in the Department of Family Medicine at the University of Ottawa in Ontario. Research Associate at the C.T. Lamont Primary Health Care Research Centre. Medical student at the Saba University School of Medicine in The Bottom, Dutch Caribbean. Objective To explore the perspectives of patients who live with multiple chronic conditions as they relate to the challenges of self-management. Data sources On September 30, 2013, we searched MEDLINE, EMBASE, and CINAHL using relevant key words including chronic disease, comorbidity, multimorbidity, multiple chronic conditions, self-care, self-management, perspective, and perception. Study selection Three reviewers assessed and extracted the data from the included studies after study quality was rated. Qualitative thematic synthesis method was then used to identify common themes. Twenty-three articles met the inclusion criteria, with most coming from the United States. Synthesis Important themes raised by people living with multiple chronic conditions related to their ability to self-manage included living with undesirable physical and emotional symptoms, with pain and depression highlighted. Issues with conflicting knowledge, access to care, and communication with health care providers were raised. The use of cognitive strategies, including reframing, prioritizing, and changing beliefs, was reported to improve people’s ability to self-manage their multiple chronic conditions. Conclusion This study provides a unique view into patients’ perspectives of living with multiple chronic conditions, which are clearly linked to common functional challenges as opposed to specific diseases. Future policy and programming in self-management support should be better aligned with patients’ perspectives on living with multiple chronic conditions. This might be achieved by ensuring a more patient-centred approach is adopted by providers and health service organizations. The importance of supporting self-management for people with multiple chronic conditions is being increasingly recognized as a key component of improving the overall health of this population.6–10 Self-management relates to “the tasks that individuals must undertake to live well with one or more chronic conditions.”11 Self-management support uses collaborative goal setting and self-efficacy strategies to enable patients to carry out normal roles and activities and better manage the medical and emotional effects of their illnesses in partnership with health care providers.6 Self-management support interventions vary and can include such components as group meetings, motivational counseling, case management, patient education, and follow-up. Multiple studies have evaluated the effectiveness of programs designed to support self-management in patients with chronic diseases. These studies often use quantitative methods and focus on clinical outcomes.12–15 However, issues related to self-management of chronic conditions should be examined not only from the perspective of providers and the health care system itself, but also from the perspective of patients.16,17 To our knowledge, there are no qualitative reviews that address self-management of multiple chronic conditions from patients’ perspectives. Thus, the purpose of this paper is to gain a greater understanding of patients’ perspectives on living with multiple chronic conditions, specifically related to the barriers to self-management and subsequently any strategies adopted by people living with multiple chronic conditions. The results of this review should help inform both governments and the medical community to develop policy and programming in self-management support that are aligned with patients’ perspectives on living with multiple chronic conditions. We chose to examine the qualitative literature, as this type of research is most likely to provide patients’ perspectives with “conceptual depth about the patient experience.”18 Conversely, the quantitative literature on self-management focused largely on the effectiveness of various programs designed to promote self-management. There were several stages to the review, including development of the search strategy, application of inclusion and exclusion criteria, quality appraisal, and synthesis of the findings. Quality rating was done based on the Critical Appraisal Skills Programme, an accepted rating tool for qualitative research.20 The Critical Appraisal Skills Programme provides researchers with checklists designed to appraise study quality. Articles with 1 or more unacceptable items and articles with more than 4 inadequate items were rated as poor quality and excluded. We found 256 records using the search strategy, and 7 additional articles were included from hand searching references. Once duplicate removal, relevance screening, and quality appraisal were done, a final 23 articles were included in our synthesis (Figure 1). 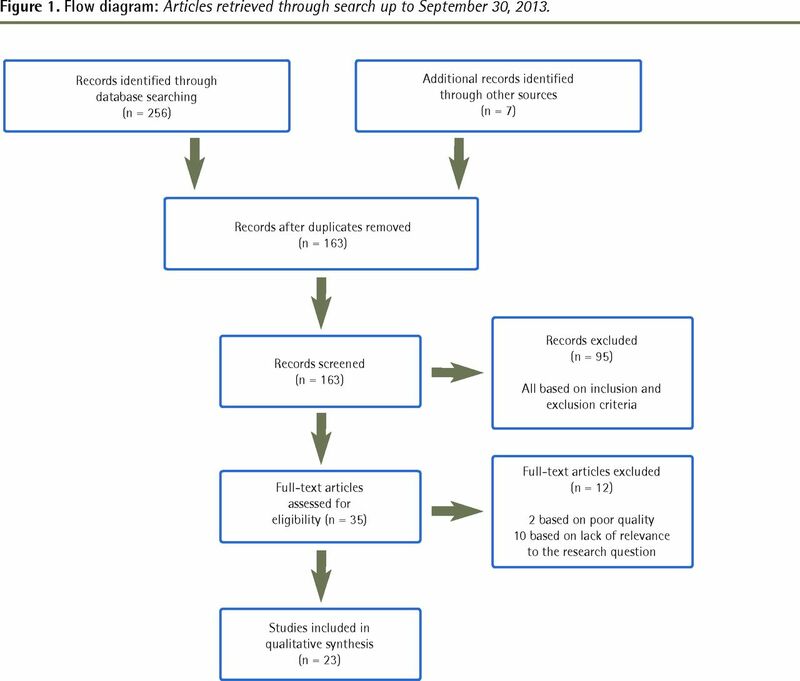 Flow diagram: Articles retrieved through search up to September 30, 2013. 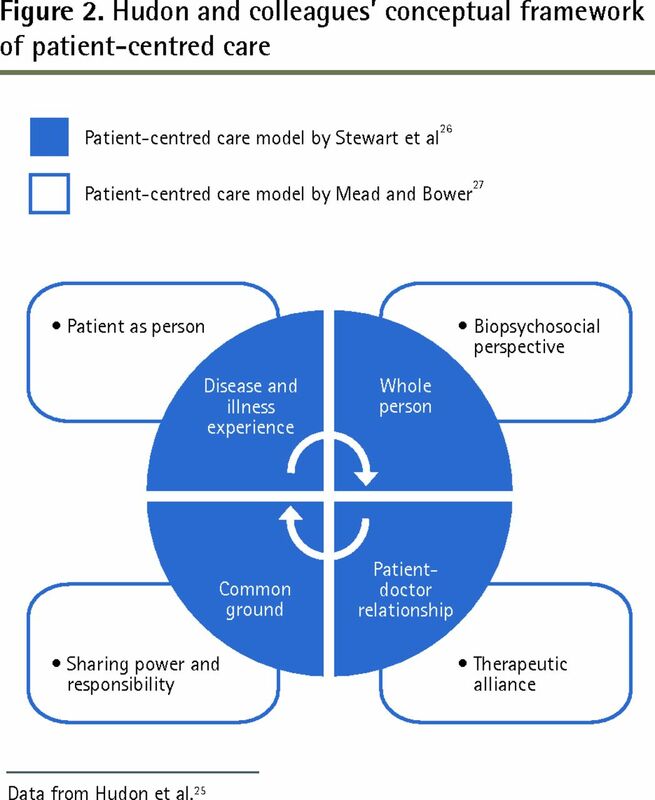 The common themes that emerged through our review can be viewed through the lens of the conceptual framework for patient-centred care described above. 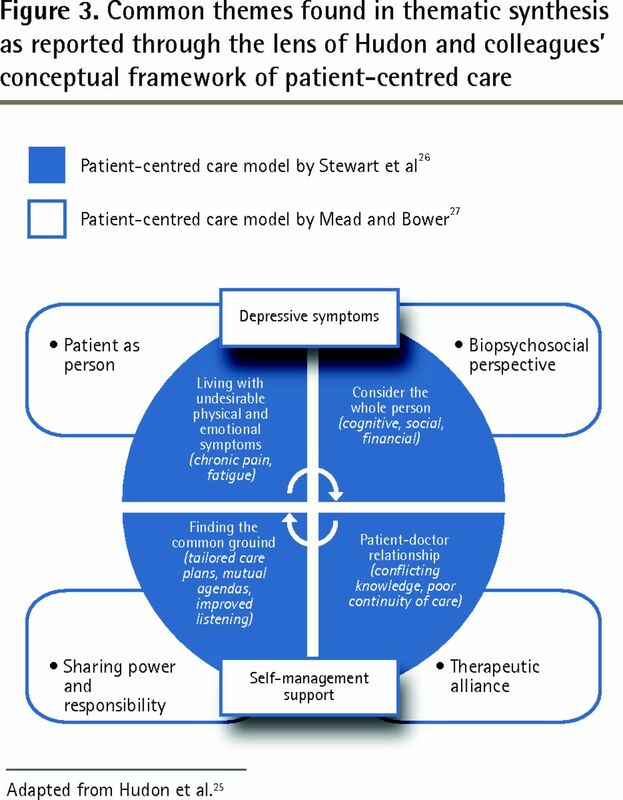 Figure 2 provides a visual depiction of Hudon and colleagues’ framework and Figure 3 illustrates the framework overlaid with our findings.25–27 Our findings are reported below, using the 4 dimensions outlined by Hudon and colleagues’ framework (patient as person, biopsychosocial perspective, therapeutic alliance, and sharing power and responsibility) as a guide. Our main findings pertaining to the patient-as-person dimension involved the experience of disease and illness. People with multiple chronic conditions experienced a great deal of suffering from physical and emotional symptoms (eg, depression). Undesirable physical and emotional symptoms and impaired physical functioning can directly prevent patients from carrying out normal daily activities, including tasks required to appropriately and successfully self-manage.28–30 In people with multiple chronic conditions, physical and emotional symptoms can compound and build off of each other, resulting in a larger negative effect on their daily lives.28,30–32 These symptoms are interdependent and symptoms of one condition can be aggravated by the symptoms, treatment, or medications of another condition. Some symptoms might overshadow others and reduce the patient’s ability to manage his or her care.7 For example, many patients reported that their pain8,28–30,32–37 was one of the biggest factors limiting their ability to self-manage effectively. Three key themes emerged related to the biopsychosocial perspective: the effect of cognitive approaches, the complexity of social support, and lack of financial resources. Our main theme pertaining to therapeutic alliance was that the doctor-patient relationship was not always therapeutic. Patients cited contradictory knowledge, poor access, and challenges with medication as barriers to care. The key theme that emerged relating to sharing power and responsibility was the importance of finding common ground between patients and providers. In our systematic review of the qualitative literature examining patients’ perspectives of living with multiple chronic conditions, we found that patients were able to clearly identify challenges associated with self-management and develop strategies to address these factors. The barriers to self-management are many and yet common among people with many different diseases. However, while most studies were disease-specific, we found that discussion among patients that related to specific medical conditions and disease-specific symptoms was strikingly absent. People did not complain about lack of skill to manage medical tasks such as injecting insulin or blood pressure monitoring; rather, they reported difficulties in dealing with physical and emotional symptoms, with depression, pain, and fatigue being prominent. In addition, issues related to knowledge about self-management of conditions commonly arose because of confusing and often contradictory information provided by multiple health care providers. Yet medical task management and patient education remain the focus of the medical community, with much of the programming targeted toward disease groups and optimizing care for target control of a specific condition (eg, hemoglobin A1c for people with diabetes).8,49,50 Thus, there is a need to support more programming such as the group generic Chronic Disease Self-Management Program,51 which remains the most widely adopted self-management support program internationally. The generic approach highlights active goal setting, problem solving, adoption of healthy lifestyles, navigating the medical system including communication with providers, and medication management within the context of general symptoms, such as pain, fatigue, and stress. It aligns very well with the body of literature relating to the experiences of people living with multiple chronic conditions. Our focus on the qualitative literature enabled us to capture papers that reported in depth on patient perspectives of living with multiple chronic conditions. The synthesis methods for qualitative literature are still under development and there are limited formal guidelines available,22 so where possible we built our approach based on other published qualitative reviews. We might have missed other relevant papers owing to lack of validation of the terms related to multimorbidity, and by excluding the quantitative research in this area as well as limiting included publications to the English language only. Finally, several important variables that might have contributed to the ability of patients to self-manage were not always reported by the research studies. These included social determinants of health such as socioeconomic status, educational level, disease duration, and patient self-efficacy. A small body of quantitative research has found that social disadvantage and lower levels of education are associated with a reduced likelihood of patients engaging in self-management.62,63 However, qualitative research examining these variables from patients’ perspectives would be valuable, and additional research should be conducted to further explore the effects of social determinants of health on self-management. There are many complexities to the delivery of care for people with multiple chronic conditions. The burden of suffering is great, as is the increasing burden to the health care system and society as a whole. This review provides a unique view into patients’ perspectives of living with multiple chronic conditions, which are clearly linked to functional challenges and are not disease specific. Future policy and programming in self-management support should be better aligned with patients’ perspectives of living with multiple chronic conditions and this might be achieved by ensuring a more patient-centred approach is adopted by providers and health service organizations. This review provides a unique view into patients’ perspectives of living with multiple chronic conditions, which are clearly linked to functional challenges and are not disease specific. Patients were able to clearly identify challenges associated with self-management and develop strategies to address these factors. People did not complain about lack of skill to manage medical tasks such as injecting insulin or blood pressure monitoring; rather, they reported difficulties in dealing with physical and emotional symptoms, with depression, pain, and fatigue being prominent. Issues related to knowledge about self-management of conditions commonly arose because of confusing and often contradictory information provided by multiple health care providers. Cette revue est une occasion unique de savoir ce que les personnes souffrant de plusieurs maladies chroniques rencontrent comme défis, lesquels sont clairement reliés à des difficultés fonctionnelles et non à des maladies particulières. Les patients pouvaient facilement identifier les problèmes liés à l’autogestion de leur santé et développer des stratégies pour y faire face. Les patients ne se plaignaient pas d’un manque de compétences pour des tâches médicales, comme les injections d’insuline ou la mesure de la tension artérielle; ils mentionnaient plutôt avoir des difficultés à gérer certains symptômes physiques ou psychologiques, tels que la dépression, la douleur et la fatigue, qui constituent des problèmes particulièrement importants en rapport avec l’autogestion de leur condition à cause des renseignements confus et souvent contradictoires qu’ils reçoivent des nombreux soignants. All authors participated in the planning, execution, or analysis of this study. All authors have read and approved the final submitted version.
. Future of multimorbidity research: how should understanding of multimorbidity inform health system design? Public Health Rev 2010;32(2):451-74.
. Persons with chronic conditions. Their prevalence and costs. JAMA 1996;276(18):1473-9.
. Seniors and the health care system: what is the impact of multiple chronic conditions? Ottawa, ON: Canadian Institute for Health Information; 2011. Available from: https://secure.cihi.ca/free_products/air-chronic_disease_aib_en.pdf. Accessed 2014 May 28.
. Multimorbidity in primary care: a systematic review of prospective cohort studies. Br J Gen Pract 2012;62(597):e297-307.
. Self-management support for Canadians with chronic health conditions: a focus for primary health care. Toronto, ON: Health Council of Canada; 2012. Available from: http://healthcouncilcanada.ca/rpt_det.php?id=372. Accessed 2014 Oct 24.
. Descriptions of barriers to self-care by persons with comorbid chronic diseases. Ann Fam Med 2003;1(1):15-21.
. The challenges of multimorbidity from the patient perspective. J Gen Intern Med 2007;22(Suppl 3):419-24.
. Supporting self-management. In: Nolte E, McKee M, editors. Caring for people with chronic conditions. A health system perspective. Berkshire, UK: Open University Press; 2008. p. 116-42.
. Comorbidity or multimorbidity: what’s in a name? A review of literature. Eur J Gen Pract 1996;2(2):65-70.
, editors. The first annual Crossing the Quality Chasm Summit. A focus on communities. Washington, DC: The National Academies Press; 2004.
. How effective are expert patient (lay led) education programmes for chronic disease? BMJ 2007;334(7606):1254-6.
. Impact of a chronic disease self-management program on health care utilization in rural communities: a retrospective cohort study using linked administrative data. BMC Health Serv Res 2014;14:198.
. Alberta Healthy Living Program—a model for successful integration of chronic disease management services. Can J Diabetes 2013;37(4):254-9. Epub 2013 Aug 2.
. Effectiveness of a generic chronic disease self-management program for people with type 2 diabetes: a translation study. Diabetes Educ 2013;39(5):655-63. Epub 2013 Jun 19.
. Introduction: a sociological focus on ‘expert patients’. Health Sociol Rev 2009;18(2):139-44.
. Patients as partners in managing chronic disease. Partnership is a prerequisite for effective and efficient health care. BMJ 2000;320(7234):526-7.
. Qualitative systematic reviews of treatment burden in stroke, heart failure and diabetes—methodological challenges and solutions. BMC Med Res Methodol 2013;13:10.
. International Research Community on Multimorbidity. Sherbrooke, QC: University of Sherbrooke; 2012. Available from: www.usherbrooke.ca/crmcspl/en/international-research-community-on-multimorbidity/. Accessed 2014 May 29.
. Critical Appraisal Skills Programme. Making sense of evidence. Oxford, UK: Critical Appraisal Skills Programme; 2013. Available from: www.casp-uk.net. Accessed 2014 May 28.
. Synthesizing qualitative and quantitative health evidence. A guide to methods. Berkshire, UK: Open University Press; 2007.
. Methods for the thematic synthesis of qualitative research in systematic reviews. BMC Med Res Methodol 2008;8:45.
. A guide to synthesising qualitative research for researchers undertaking health technology assessments and systematic reviews. Edinburgh, UK: NHS Quality Improvement Scotland; 2010.
. Synthesising qualitative and quantitative evidence: a review of possible methods. J Health Serv Res Policy 2005;10(1):45-53.
. Measuring patients’ perceptions of patient-centered care: a systematic review of tools for family medicine. Ann Fam Med 2011;9(2):155-64.
. Patient-centered medicine. Transforming the clinical method. Thousand Oaks, CA: Sage; 1995.
. Patient-centredness: a conceptual framework and review of the empirical literature. Soc Sci Med 2000;51(7):1087-110.
. Barriers and facilitators to chronic pain self-management: a qualitative study of primary care patients with comorbid musculoskeletal pain and depression. Pain Med 2009;10(7):1280-90.
. Processes of care desired by elderly patients with multimorbidities. Fam Pract 2008;25(4):287-93. Epub 2008 Jul 14.
. Older women’s experiences with multiple health conditions: daily challenges and care practices. Health Care Women Int 2005;26(8):672-92.
. Challenges for co-morbid chronic illness care and policy in Australia: a qualitative study. Aust New Zealand Health Policy 2009;6:22.
. Collaborative care needs and preferences of primary care patients with multimorbidity. Health Expect 2005;8(1):54-63.
. The role of social support in multiple morbidity: self-management among rural residents. J Health Care Poor Underserved 2011;22(3):756-71.
. Perceived challenges and priorities in co-morbidity management of older patients with type 2 diabetes. Diabet Med 2011;28(7):781-4.
. A qualitative meta-analysis of heart failure self-care practices among individuals with multiple comorbid conditions. J Card Fail 2011;17(5):413-9. Epub 2011 Jan 21.
. Managing multiple morbidity in mid-life: a qualitative study of attitudes to drug use. BMJ 2003;327(7419):837.
. Frequent consulting and multiple morbidity: a qualitative comparison of ‘high’ and ‘low’ consulters of GPs. Fam Pract 2008;25(3):168-75. Epub 2008 Apr 30.
. Barriers to self-management and quality-of-life outcomes in seniors with multimorbidities. Ann Fam Med 2007;5(5):395-402.
. Self-management perspectives of heavily comorbid primary care adults. Prof Case Manag 2011;16(1):6-15.
. African American older adults coping with chronic health conditions. J Transcult Nurs 2006;17(2):139-47.
. Shifting priorities in multimorbidity: a longitudinal qualitative study of patient’s prioritization of multiple conditions. Chronic Illn 2011;7(2):147-61. Epub 2011 Feb 22.
. Appalachian residents’ experiences with and management of multiple morbidity. Qual Health Res 2011;21(5):601-11. Epub 2011 Jan 24.
. Cascading crises, resilience and social support within the onset and development of multiple chronic conditions. Chronic Illn 2009;5(2):92-102.
. Chronic illness: the process of integration. J Clin Nurs 2008;17(7B):177-87.
. “It’s a toss up between my hearing, my heart, and my hip”: prioritizing and accommodating multiple morbidities by vulnerable older adults. J Health Care Poor Underserved 2009;20(1):134-51.
. Striving for control: cognitive, self-care, and faith strategies employed by vulnerable black and white older adults with multiple chronic conditions. J Cross Cult Gerontol 2008;23(4):377-99. Epub 2008 Nov 6.
. Families, social support, and self-care among older African-American women with chronic illness. Am J Health Promot 2008;22(5):342-9.
. Health literacy self-management by patients with type 2 diabetes and stage 3 chronic kidney disease. West J Nurs Res 2009;31(5):627-47. Epub 2009 Apr 23.
. The patient’s voice: an exploratory study of the impact of a group self-management support program. BMC Fam Pract 2012;13:65.
. Managing patients with multimorbidity: systematic review of interventions in primary care and community settings. BMJ 2012;345:e5205.
. Chronic Disease Self-Management Program (Better Choices, Better Health Workshop). Stanford, CA: Stanford School of Medicine; 2014. Available from: http://patienteducation.stanford.edu/programs/cdsmp.html. Accessed 2014 May 30.
. Testing a model of patient characteristics, psychologic status, and cognitive function as predictors of self-care in persons with chronic heart failure. Heart Lung 2009;38(5):410-8. Epub 2009 Feb 14.
. Medication knowledge, adherence and predictors among people with heart failure and chronic obstructive pulmonary disease. J Nurs Healthc Chronic Illn 2011;3(1):30-40.
. A model of the process of transformation in primary care for people living with chronic illnesses. Chronic Illn 2010;6(4):282-93. Epub 2010 Oct 4.
. The need for a transformed clinical method. In: Stewart M, Roter D, editors. Communicating with medical patients. London, UK: Sage Publications; 1989.
. Helping patients manage their chronic conditions. Oakland, CA: California Health Care Foundation; 2005. Available from: http://selfmanagementalliance.org/wp-content/uploads/2013/09/HelpingPatientsManageTheirChronicConditions.pdf. Accessed 2014 May 28.
. Organizing care for patients with chronic illness. Milbank Q 1996;74(4):511-44.
. The patient-centered medical home: strategies to put patients at the center of primary care. AHRQ Publication No. 11-0029. Rockville, MD: Agency for Healthcare Research and Quality; 2011.
. Transforming Ontario’s health care system. Community health links provide coordinated, efficient and effective care to patients with complex needs. Toronto, ON: Ministry of Health and Long-Term Care; 2014. Available from: www.health.gov.on.ca/en/pro/programs/transformation/community.aspx. Accessed 2014 May 29.
. The impact of not having a primary care physician among people with chronic conditions. Toronto, ON: Institute for Clinical Evaluative Sciences; 2008.
. Population patterns of chronic health conditions, co-morbidity and healthcare use in Canada: implications for policy and practice. Healthc Q 2008;11(3):70-6.
. Self-management strategies in overweight and obese Canadians with arthritis. Arthritis Care Res (Hoboken) 2012;64(2):280-6.
. Barriers to adult hemodialysis patients’ self-management of oral medications. Am J Kidney Dis 2010;56(3):547-57. Epub 2010 Apr 28.